I discovered recently that I had missed a set when I did my round up of the 2006 World Baseball Classic sets a few years back. There was also a 15 card insert set for the Upper Deck Ovation set called "Ovation Nation". 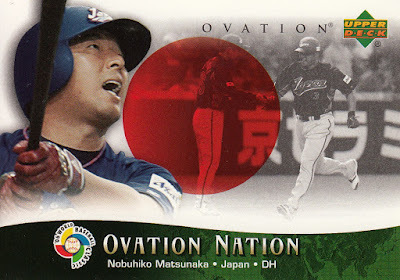 There are only two members of the Japanese team included in the set - Daisuke Matsuzaka and Nobuhiko Matsunaka - although there are four other players who ended up playing in NPB - Seung-Yeop Lee of Korea (Marines/Giants/Buffaloes 2004-2011), Andruw Jones of The Netherlands (Eagles 2013-14), Daniel Cabrera of the Dominican Republic (Dragons 2013-14) and Frederich Cepeda (Giants 2014-). You can see the entire checklist here. 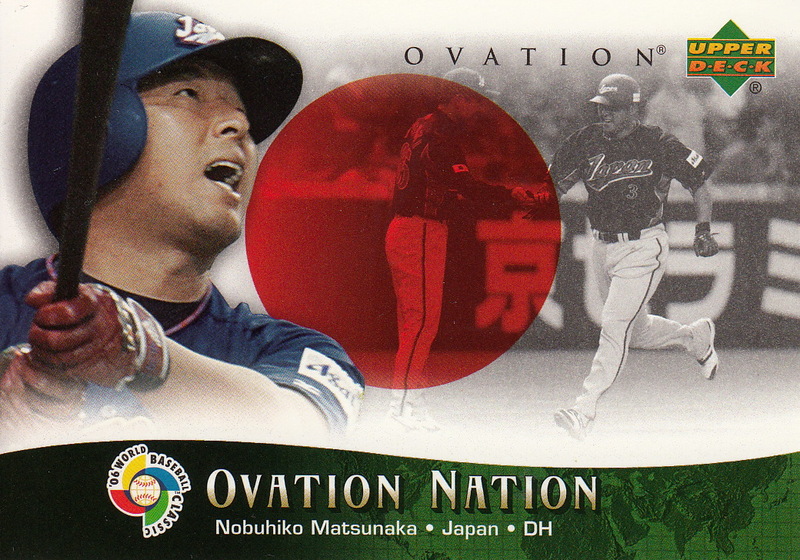 This brings the totals for the 2006 WBC sets to 335 cards over eight separate sets with 56 cards for the champion Japanese team. Matsunaka is the only Japanese player to appear in all eight sets. 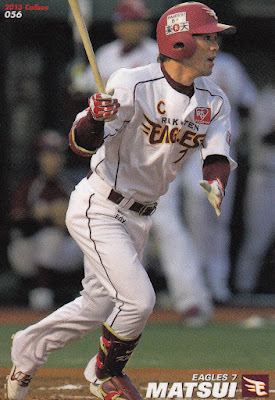 The checklist for Series Three of this year's Calbee set appeared in their website recently. This set will be a bit smaller than the two previous sets this year. 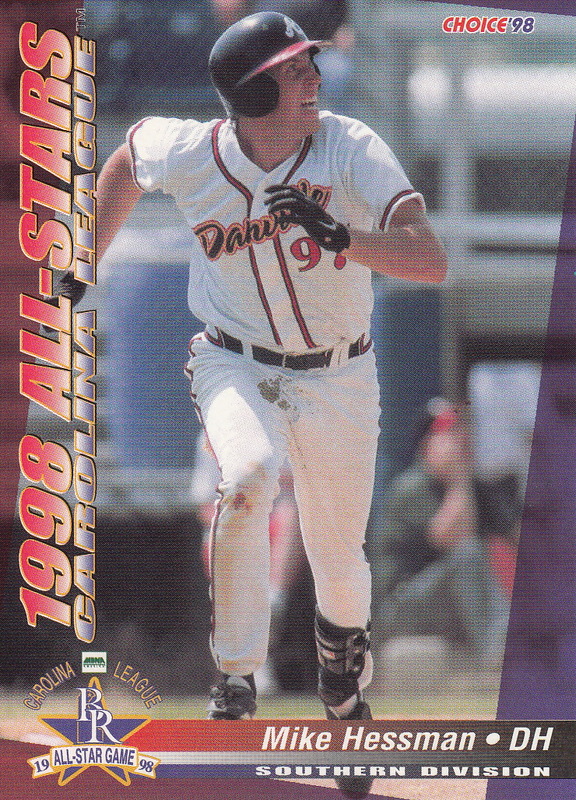 This edition only has 72 player cards (6 per team) rather than the 84 that each of the other two sets had. There is one subset/non-premium insert set called "Exciting Scene" which is a continuation of the Series One subset of the same name. It will 12 cards (one card per team). 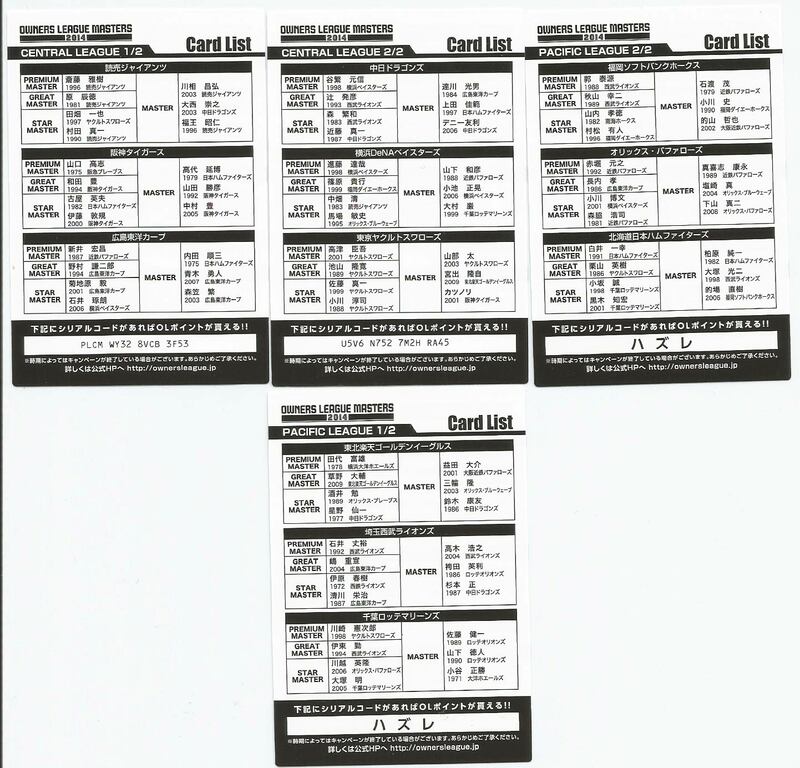 There are also the ubiquitous four checklists cards which bring the total number of cards in the base set to 88 (down from 103 in Series One and 100 in Series Two). 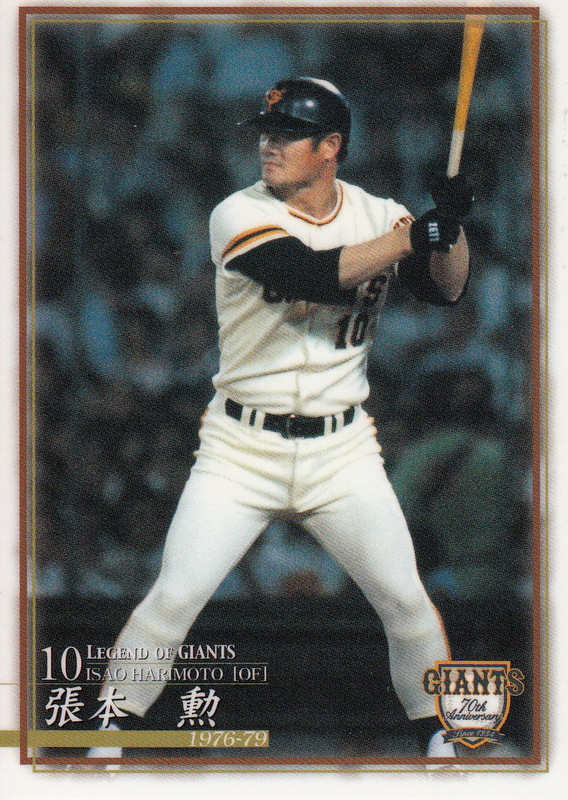 There is also the standard 24 card (2 per team) "Star" insert set and a 12 card mail in premium box set called something like "total hit card" which looks like it features the active player on each team with the most career hits (although not necessarily with the team he is now on). 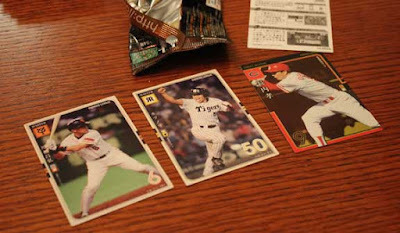 The earlier sets also had possible "lucky" cards that could be obtained through a redemption card but there's no information about anything like that for this Series - at least not yet. There's no release date mentioned on the website but historically the third Series has been released around September 20th each year so I'd expect to see it around then. In honor of BBM actually having a timely update to their website, I thought I'd do a quick post on newly listed set - the annual high end set called Genesis. 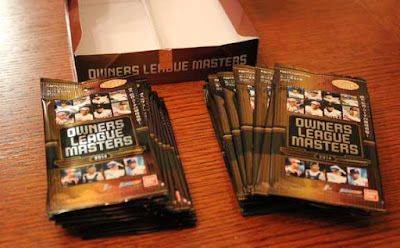 The base set is 120 cards - 108 player cards (9 per team) and 12 team checklists. 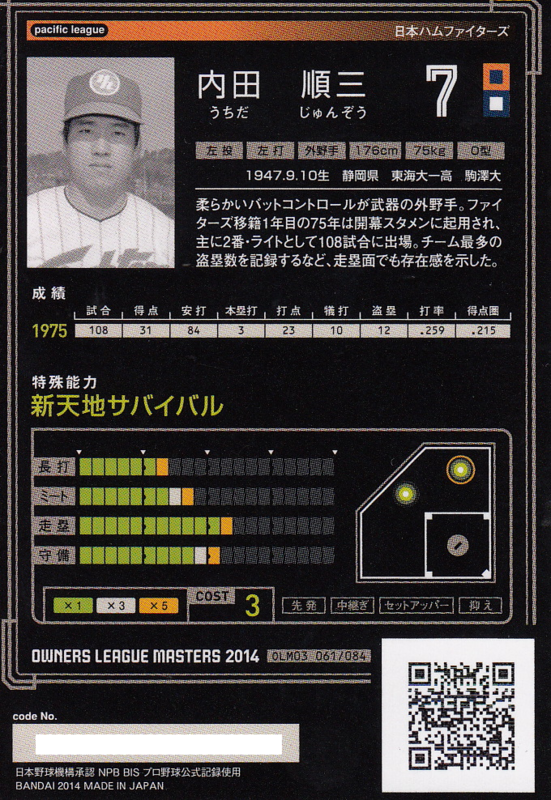 The player cards all have some myriad of possible parallels that are not detailed on BBM's website. But honestly, no one cares about the base set for Genesis. There are three 12 card insert sets - ELITE OF NINE, SPLENDID BLUE and GREAT WAVE - I think each card in the inserts is serially numbered to 50. 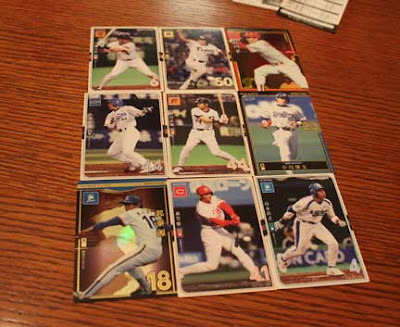 Then there's all the "special" cards - autographed cards, autographed baseball cards, patch cards, super patch cards, bat end cards and various permutations of these. 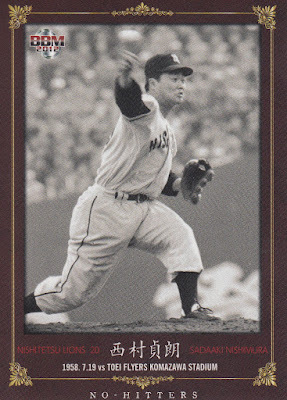 The new thing appears to be some sort of "booklet" card - I'm guessing they're a little better quality than the kind that Topps did as inserts in 1970. Interestingly there's no Cross Plasma cards in this set - this will be the first time that 1st and 2nd Version had a cross set subset without the high end set having it as well. BBM says that the set will be out in mid-September - Jambalaya has a release date of September 18. 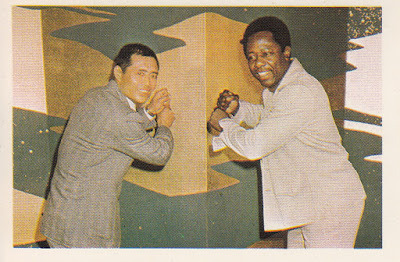 This is card #89 from the 1977 NST "Mr Baseball" set and, of course, shows both Sadaharu Oh and Henry Aaron. I think there's a similar card in one of the mid-70's Calbee sets but I couldn't find it in the listings so I could be wrong. You have probably heard that Mike Hessman of the Toledo Mud Hens broke Buzz Arlett's record for most home runs in the minor leagues a few weeks ago (and if you haven't, here's a great piece by Joe Posnanski about it). Hessman would have broken the record sooner but he spent 2011 in Japan with the Orix Buffaloes. 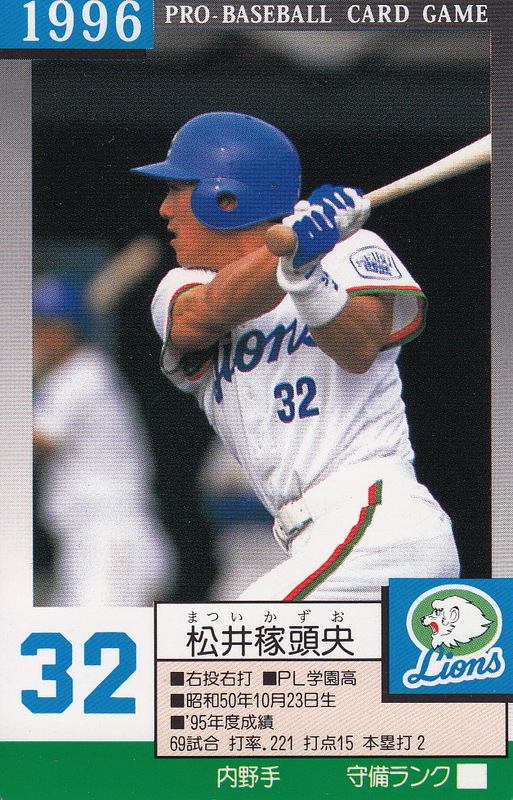 He got into 48 games at the ichi-gun level, hitting .192 with six home runs. 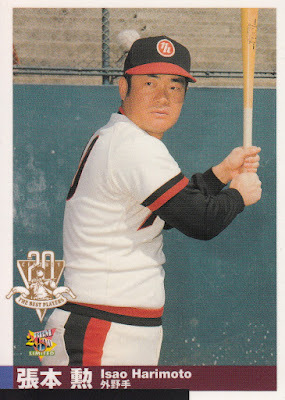 He fared only a little better with the Buffaloe's ni-gun team, hitting .243 with 8 home runs in 36 games. - BBM's last update until last week was for this year's second cheerleader/dance team set - the Dancing Heroine - Mai set. 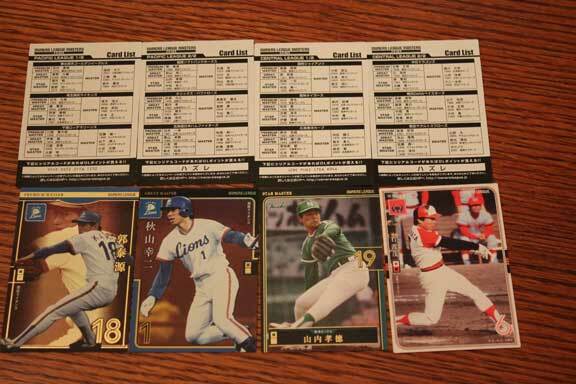 This is a 96 card set featuring cards of the cheerleader and dance teams for ten of the 12 NPB teams (the Carp and Baystars teams are not included). The set actually came out a couple weeks ago. 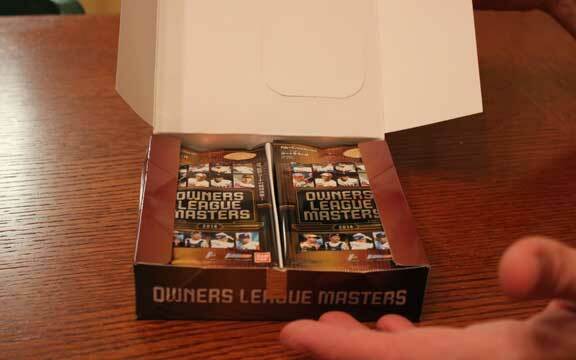 - BBM will be releasing several team box sets later this month. There's the Carp Authentic Edition (due out August 21st), the Dragons Autographed Edition (released on August 26) and the Tigers Authentic Edition (due out August 27th). 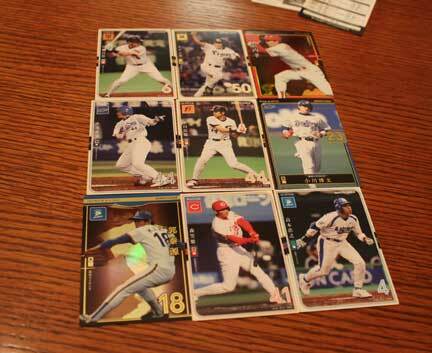 There are 27 cards in the base set for the Carp and Dragons sets and 18 in the Tigers set. 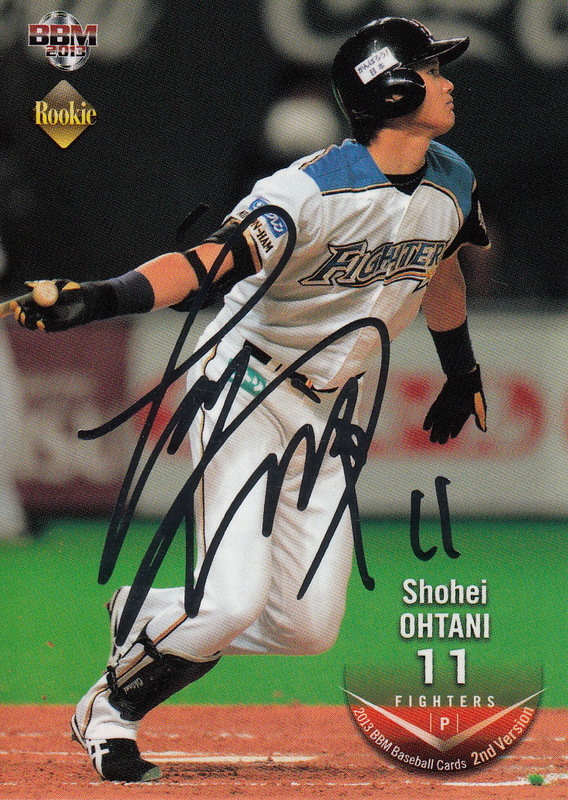 The Dragons set also contains an autographed card while the Carp and Tigers sets contain either an autograph or memorabilia card. 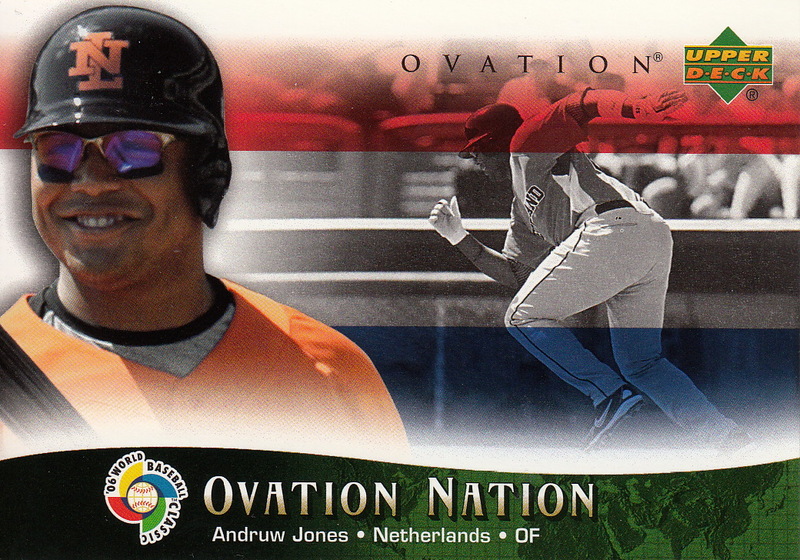 The Tigers set features pitchers only. - Epoch is releasing their first box set dedicated to an active team - the Baystars Game Used Uniform Edition - this coming November. 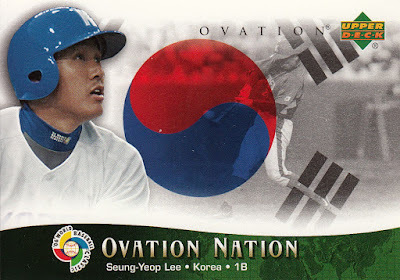 The set will contain 17 cards - 16 in the base set and a "special" card that could be a memorabilia card or an autograph card. I don't pay a lot of attention to the collectible card game sets that Konami and Bandai publish in Japan. There's really no good reason for that other than the fact that there aren't many of those cards available in the places that I normally am looking for cards and the fact that BBM and Calbee keep me pretty busy with their issues (as well as Epoch and Front Runner). 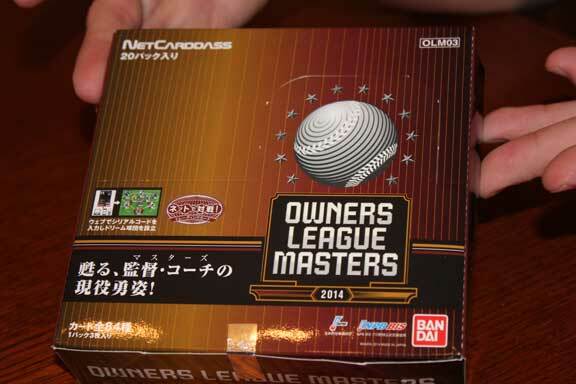 So when Jay Shelton contacted me a little while back and offered to send me box break photos and stats for a 2014 Owners League set from Bandai, I jumped at the opportunity to learn something about the cards. According to the Trading Card Database, Bandai put out four sets last year - two with 144 cards and two with 132 cards - for a total of 552 cards. But it turns out that the box Jay got was not one of those four sets - it was a "Masters" set that contained cards of retired (OB) players. 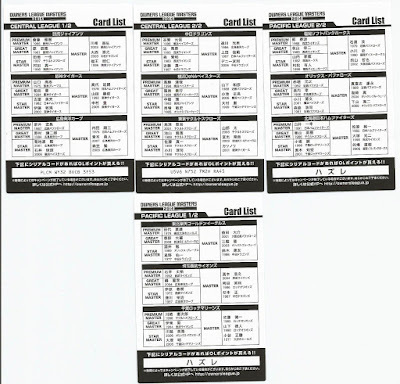 The set contains 84 cards in four different types or subsets. There are 12 "Premium Master" cards, 12 "Great Master" cards, 24 "Star Master" cards and 36 "Master" cards. (You're probably making an assumption about the fact that they are all multiples of 12 and you'd be correct sort of but more on that in a minute). 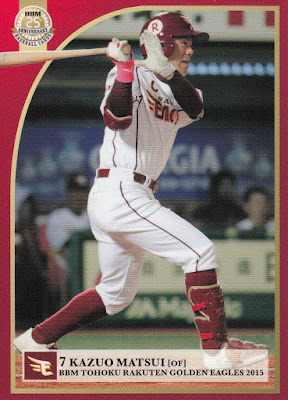 The "Premium Master", "Great Master" and "Star Master" all appear to be short printed so similar to the recent Korean Superstar Baseball set, over half the cards in the set are short prints. From left to right, that's the "Premium Master" card for Taigen Kaku (#022), the "Great Master" card for Koji Akiyama (#023), the "Star Master" card for Takanori Yamauchi (#024) and the "Master" card for Shigeru Ishiwata (#026). So two things stood out about the checklists - there weren't any numbers on the checklists (despite the cards themselves having numbers) and the cards were grouped by teams. 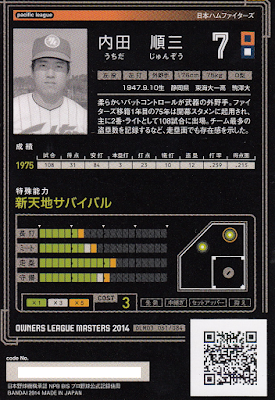 So each team has one "Premium Master" and one "Great Master" card, two "Star Master" cards and three "Master" cards. All of which made sense to me. Then I tried to locate the Koji Akiyama card on the checklist, assuming that since he was pictured in a Lions uniform, he'd be listed with the Lions. 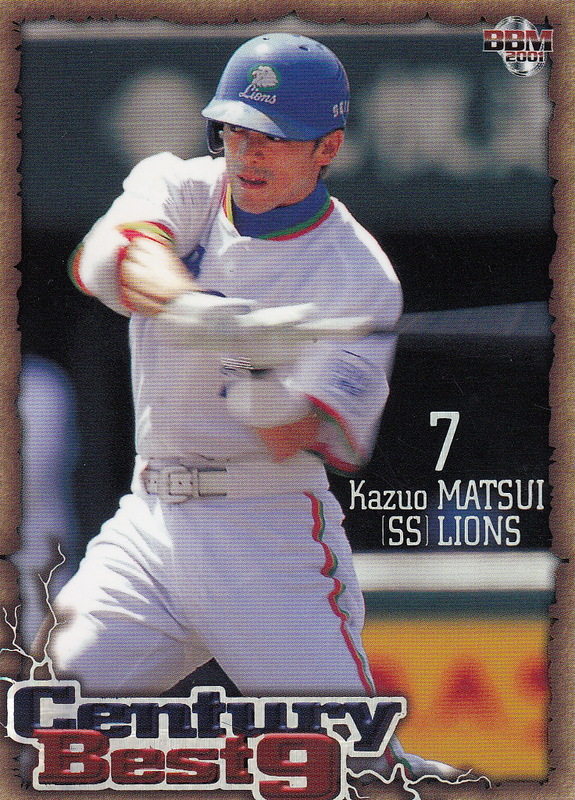 But Koji Akiyama is not listed in the Lions section. Koji Akiyama is listed in the Hawks section. And if you look closely at his listing, it also lists a year (1989) and the team he's depicted with (the Seibu Lions). 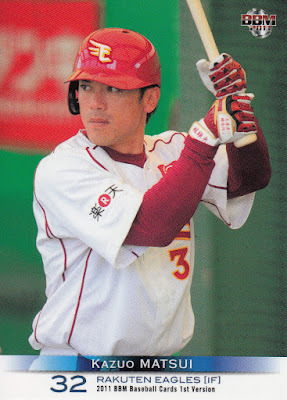 OK, that's kind of odd but Akiyama did play for the Hawks, so maybe that's why he's there. 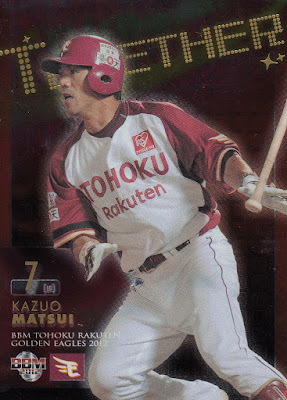 I next decided to locate the Taigen Kaku card. I first looked in the Lions section. Nope, not there. I found him in the Hawks section as well. Now I really started wondering what was going on because Kaku never played for the Hawks. So I did a quick search on Kaku on Japanese wikipedia and had an epiphany. Taigen Kaku was the pitching coach for the Hawks in 2014. Now I'm not the sharpest tool in the woodshed but you don't have to hit me over the head with a shovel for me to see a trend. Because as you probably already realized, Koji Akiyama was the manager of the Hawks in 2014. A little more research showed that the other five guys listed with the Hawks on the checklist were on their coaching staff in 2014. Some more research showed that the same held true for the remainder of the teams. So just to recap - the cards are organized by team even if the teams shown on the cards don't match the team the card is grouped with. 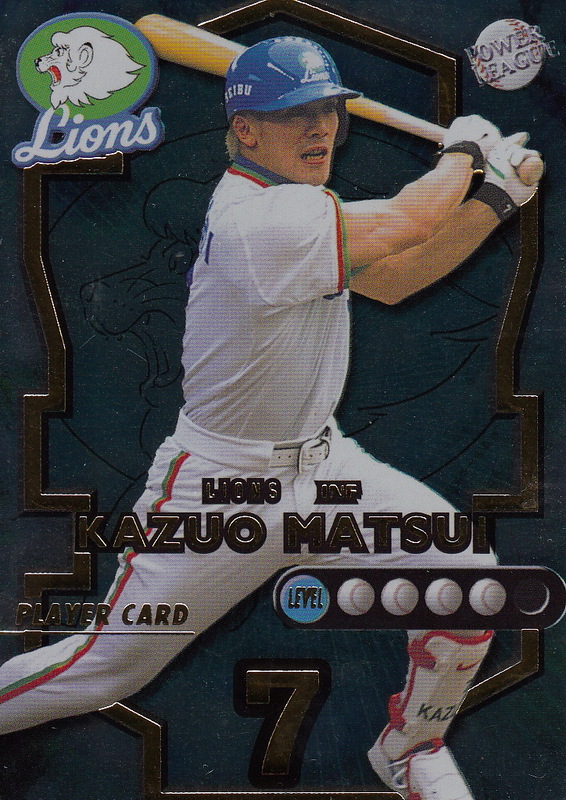 Akiyama and Kaku are pictured on the Lions but their cards are grouped with the Hawks. It took me the better part of a week, but I did manage to identify every member of the set. 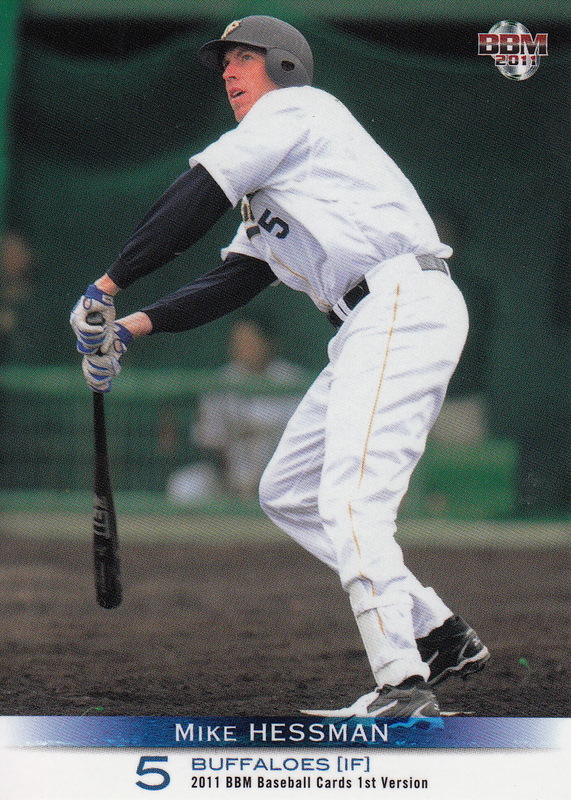 It would have been faster but it didn't occur to me that Yakyu Baka had published all the teams' coaching staffs for 2014 during the 2013-14 off season until just the other day, so I did it all by pattern matching the kanji. 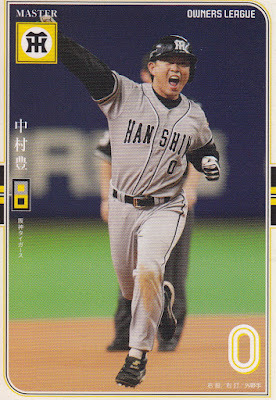 I was able to deduce the numbering scheme based on how most Japanese card companies order their cards - the pennant winner (first place team) from the league that had the Nippon Series winning team is listed first, followed by the second through sixth place teams. This is then followed by the other league in order of their finish. Since the Eagles won both the Pacific League pennant and the Nippon Series in 2013, they would be the first seven cards in the set, followed by the Lions, Marines, Hawks, Buffaloes, Fighters and then the Central League teams - the Giants, Tigers, Carp, Dragons, Baystars and Swallows. 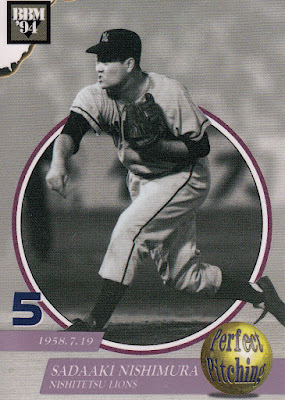 As you can see, each player is depicted in his playing days and one year from his career is highlighted - this is the year shown on the checklist as well as the only stat line on the back. I assume that the photo is from that year as well although I don't know that for sure. What I don't see on the card is anything that associates the card with the team that the player is now a coach for - for example, I don't see anything on Uchida's card that says he's with the Carp. Each card has a unique code on the back that I assume activates them for some sort of on-line game. This is an odd little set. 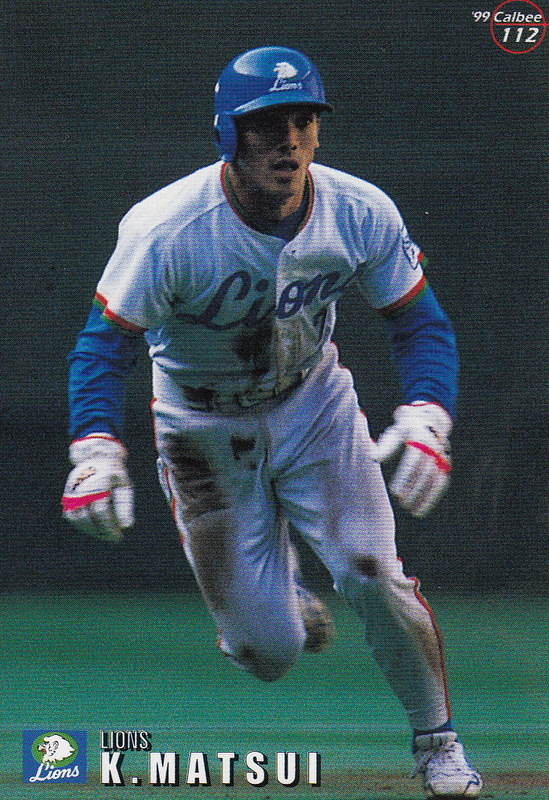 I'm not sure what the criteria for picking the guys from the coaching staff was but I find it odd that none of the guys who've moved from being a coach to being the manager for their team in the past year or so - Norio Tanabe of the Lions, Hiromoto Okubo of the Eagles, Koichi Ogata of the Carp, Junichi Fukura of the Buffaloes and Mitsuru Manaka of the Swallows - are in the set. 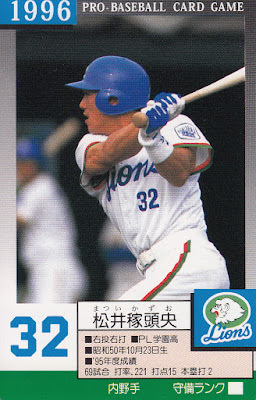 There are a handful of star players in the set - Akiyama, Takahiro Ikeyama, Takuro Ishii, Senichi Hoshino, Tatsunori Hara, Masaki Saitoh, Motonobu Tanishige, Kenjiro Nomura and Tsutomu Itoh - but they are all among the short printed cards. The biggest names in the "regular" cards are probably Masahiro Kawai and Yui "Denny" Tomori. 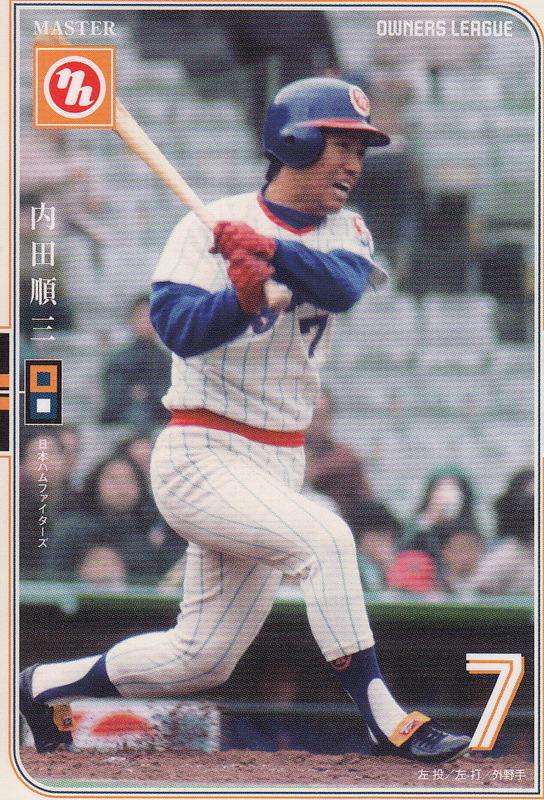 There's also a couple pretty big stars on coaching staffs that are not in the set - Akira Etoh of the Giants and Masayuki Kakefu of the Tigers come to mind. On the plus side, the cards are attractive and the box was fairly cheap (Jay paid around $19 for the box from a seller on Amazon which included free shipping from Japan). My thanks to Jay for providing the photos and information about this set and trading me his doubles. 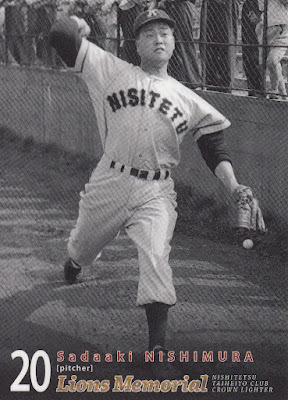 Former Nishitetsu Lions pitcher Sadaaki Nishimura has passed away from liver cancer at 80 years of age. 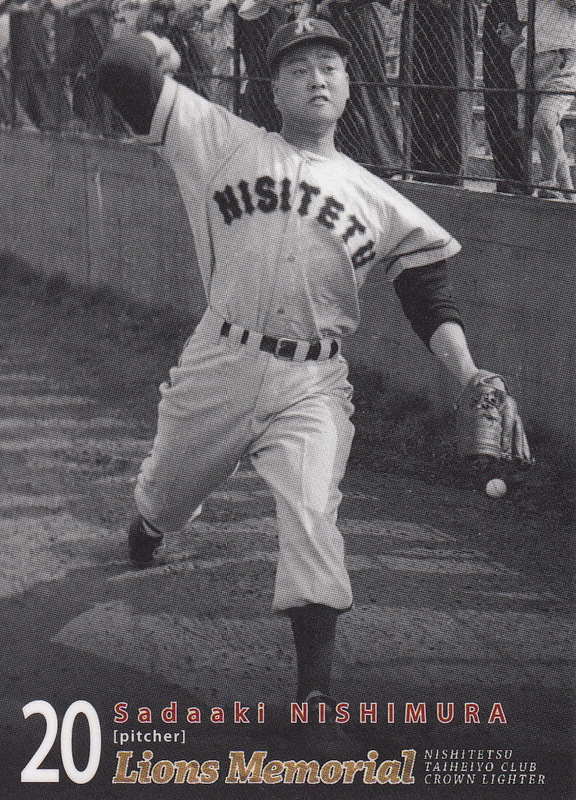 His pitched for the Lions from 1953 to 1962. He had a three year stretch between 1954 and 1956 where he went 62-18 but never approached that kind of dominance afterwards with the exception of the perfect game he threw in 1958 (the fifth one in NPB history). 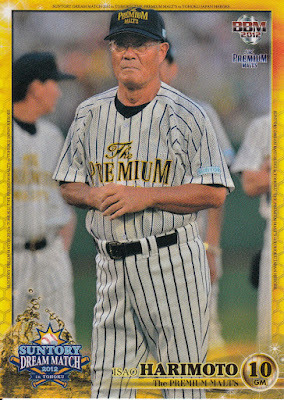 He worked as a baseball commentator after retiring as a player. He also appeared in Epoch's 2012 History Of Best Nine box set. I'm not going out on a limb here in stating that two-way player Shohei Ohtani of the Fighters is having a much better season on the mound this year than at the plate. He's currently 11-2 with a 2.28 ERA, 133 strikeouts and only 31 walks in 106 2/3 innings pitched this season. 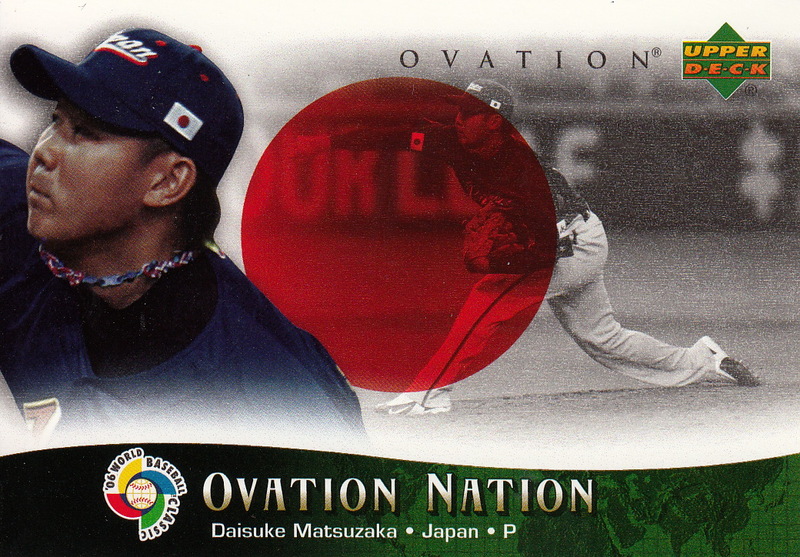 He leads the PL in wins and ERA (tied with Brandon Dickson of Orix) and is second in strikeouts to Takehiro Norimoto of the Eagles. On the other hand, he's hitting only .196 with 4 home runs at the bat. He's actually got twice as many strikeouts batting (38) than he has hits (19) - which is actually almost the same ratio as what he's done as a pitcher - opposing batters have 63 hits and 133 strikeouts. 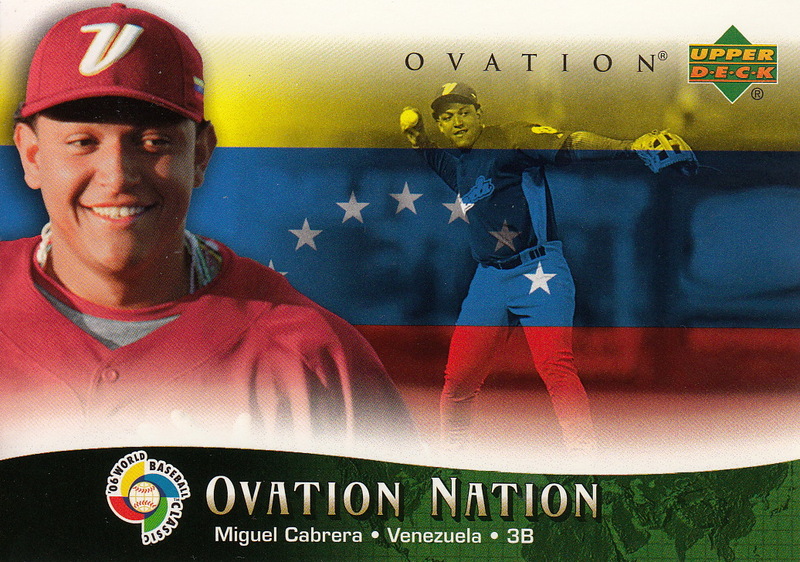 It was the first "sayanora" hit of his career. Isao Harimoto is the only Hibakusha to ever play in NPB. He was five years old when the bomb was dropped. His story is here. "When the bomb exploded, I was at a row house in Danbara-shinmachi, about 2.3 kilometers from the hypocenter. There was a flash and an enormous roar. The next thing I knew my mother was shielding me and my sister, three years older, with her body, though her back was covered in blood due to flying shards of glass. We were urged to run, in Korean, and we fled to a vineyard. Even now, 65 years after the bombing, I can still vividly recall the people groaning and the strange stench. There were dozens of people in the vineyard. When I tried to go see people who were screaming for water and jumping into a canal nearby, my mother stopped me." "My eldest sister had been mobilized at a work site at Hijiyama Hill or thereabouts. My older brother and others went to look for her and they carried her back on a stretcher. She was suffering terrible burns, on her face, too. I was shocked to see a human being, the sister I so admired, transformed into such a state. I remember bringing charred grapes to her mouth. I have no idea how many days passed after that, but one day I heard my mother crying and I knew my sister was dead." Last Tuesday Kazuo Matsui of the Eagles got his 2000th hit in NPB. 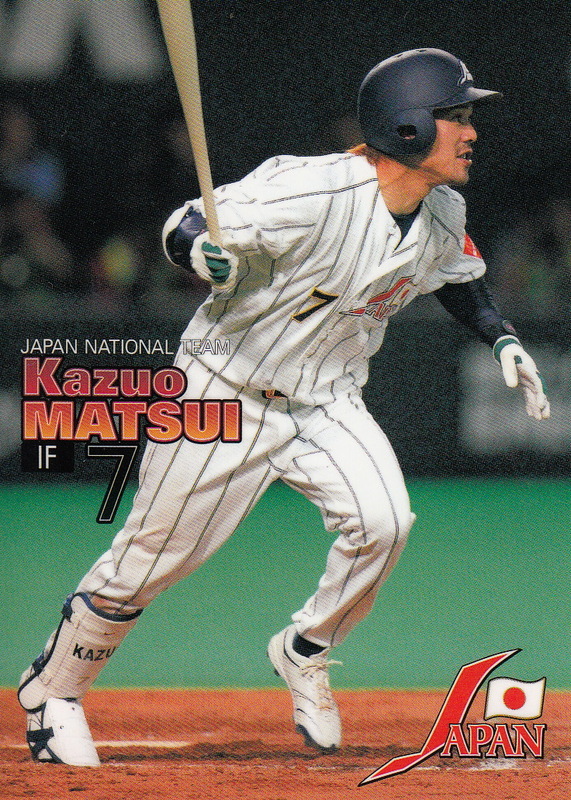 This isn't quite as big of a milestone as it would have been as Matsui had already made the Meikyukai back in 2009 when his combined NPB and MLB hit total reached 2000. He does become only the fourth player to have 2000 hits in NPB plus at least one hit in MLB (behind Hideki Matsui, Norihiro Nakamura and Alex Ramirez). I thought I'd take this opportunity to do a retrospective on Matsui. 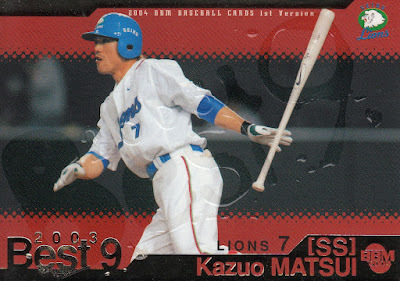 Little Matsui was taken in the third round of the fall 1993 draft by the Lions (behind Takashi Ishii and Jun Yamada). 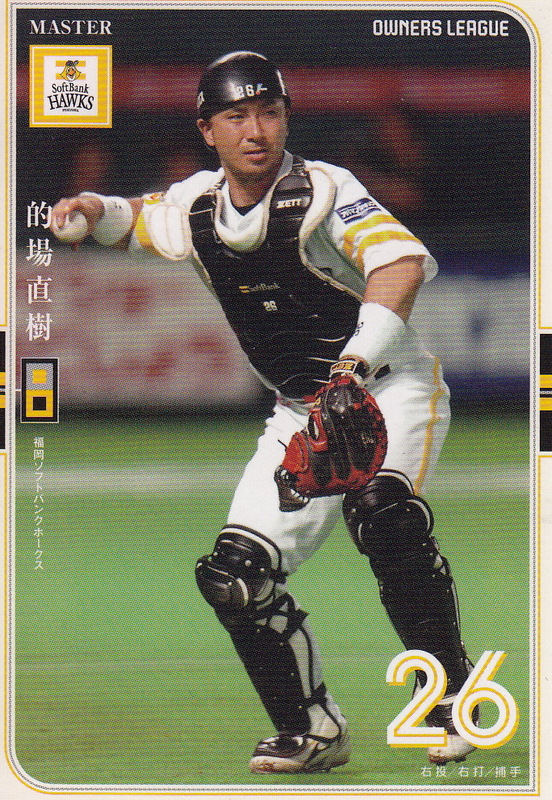 He made his debut at the ichi-gun level in 1995 and was a starter by 1996. 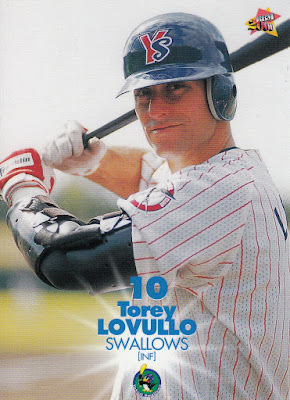 He lead the PL in steals each year from 1997-99 before adding power to his game in 2000, reaching the 20 home run plateau for the first time. He hit 24, 36 and 33 home runs in his last three seasons with the Lions before heading to MLB and the Mets for the 2004 season. He played in North America from 2004 through 2010 for the Mets, Rockies and Astros and was generally viewed as a disappointment as he never approached the kind of numbers he had put up in Japan. He returned to Japan in 2011 and joined the Tohoku Rakuten Golden Eagles. 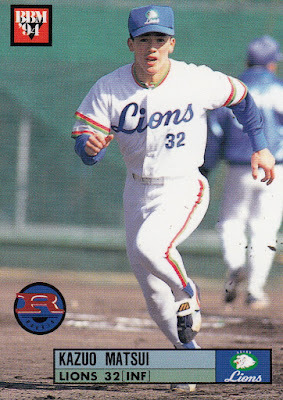 He's never repeated the power number he put up in his last four season with the Lions but he's been a steady player for the Eagles in the five seasons he's been in Sendai. Last Tuesday, Kyohei Iwasaki of the Buffaloes hit the 8000th home run in team history (including, of course, the period of time that the team was owned by Hankyu). Orix becomes the fifth team to reach this milestone, behind Yomiuri (9726), Seibu (8466), Chunichi (8352) and Softbank (8093). (Numbers through last Tuesday I assume). Seibu is the odd outlier here as the other four teams all started in the 1930's but the Lions didn't begin play until 1950 - they must have a hit a lot of home runs along the way to pass every one but the Giants. 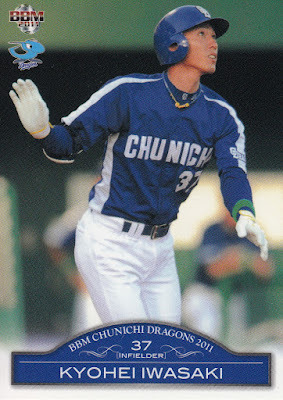 Iwasaki is an odd guy to have hit the home run - it's only the second of his career which began in 2009 in the Dragons organization.